Goodreads says, "June, 1998: At twenty seven, Catherine Coombs, also known as Cat, is struggling. She lives in London, works as a journalist, and parties hard. Her lunchtimes consist of several glasses of wine at the bar downstairs in the office, her evenings much the same, swigging the free booze and eating the free food at a different launch or party every night. When she discovers the identity of the father she never knew she had, it sends her into a spiral. She makes mistakes that cost her the budding friendship of the only women who have ever welcomed her. And nothing is ever the same after that. June, 2014: Cat has finally come to the end of herself. She no longer drinks. She wants to make amends to those she has hurt. 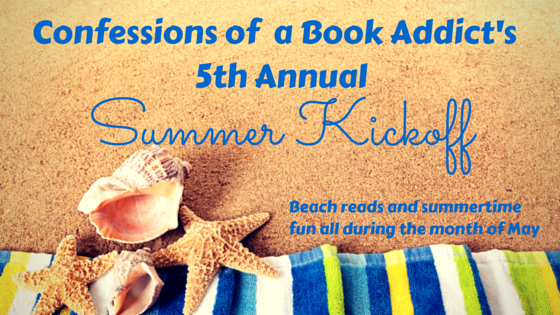 Her quest takes her to Nantucket, to the gorgeous summer community where the women she once called family still live. Despite her sins, will they welcome her again? What Cat doesn’t realize is that these women, her real father’s daughters, have secrets of their own. As the past collides with the present, Cat must confront the darkest things in her own life and uncover the depths of someone’s need for revenge." Cat is in her late twenties living the life in London during the late 90s. She has a good job, friends, and many parties to attend. She stays out too late, drinks too much, and often finds herself in compromising situations, but this is the time in her life when she is supposed to do this, right? Before she settles down? Cat refuses to think she has a problem until one time she blacks out and finds herself in a strange man's flat. The man, Jason, is a successful and very good looking TV director who is showing an interest in her both romantically and personally, as he is a recovering alcoholic himself. He convinces Cat to attend some AA meetings and get on the right path. Cat seems to be on the right path, until she gets some life-altering news from her mother. Her mother tells her that her father is not the man who raised her. Instead, it's a man her mother met in Nantucket when visiting her aunt. For Cat, this explains everything about her childhood and after talking with her new found father, she is excited to visit him in Nantucket and meet her two half sisters, Ellie and Julia. Cat is hoping this will be the missing piece of her puzzle. Things go really well in Nantucket, that is until they don't, thanks to Cat's alcohol abuse. Many years later, Cat is faced with an opportunity to make amends in Nantucket with the family she blew it with, but can they forgive her? 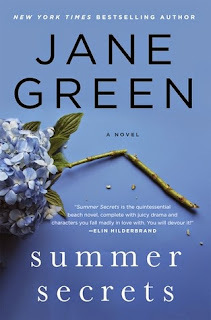 Jane Green's Summer Secrets is surprisingly dark for a summer read, but in true Jane Green fashion, I couldn't stop reading it. I had to know how it was going to end for Cat and I desperately wanted her to find happiness in her second chance at life. Cat is a tough character to root for in the beginning of Summer Secrets. She's blatantly an alcoholic and struggles to just have only one drink. The decisions she makes while under the influence of alcohol are tough to witness and I felt due to her addiction, she was self-sabotaging all the good things in her life. Her behavior was destructive, so I was glad to see Jason enter her life and try to steer her the right way. However, Cat has to do it for herself, not him, so this was always a dark cloud hanging over their relationship. Then Cat heads to Nantucket and I think to myself that it's going to actually work out. Things are going swimmingly. Her father seems like a nice guy (minus his own addiction) and her half sisters seem like decent people. She really connects with Julia, who isn't as cold as Ellie, and she finally feels like she is in a good place. That is until drama ensues due to bad decisions made under the influence. Many years later, we find Cat, sober and in a totally different place in her life. I obviously preferred this Cat and loved this new version of her. I was rooting for her from the get-go and desperately hoping she'd get her happy ending. I wanted her to make amends in Nantucket, but I knew it was going to be complicated. Green reminds us that life isn't always that simple. Timing can be tough and Green throws us a plot twist as well. 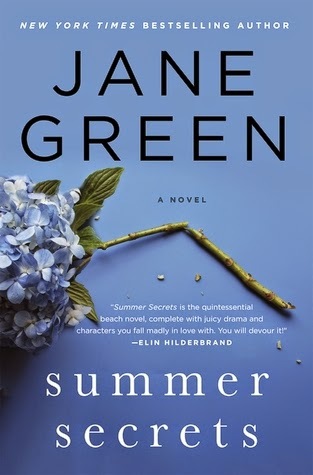 At first, I really wasn't connecting with Summer Secrets, but then before I knew it, I was half way through the novel, dying to know what was going to happen to Cat. Jane Green is a fantastic writer because she took a character, who I didn't really love, and made me extremely invested in her story. The setting of Nantucket only added to my enjoyment of the novel, which in turn, makes Summer Secrets a great addition to your beach bag. If you are a fan of Jane Green, you'll be pleased with this darker beach read that left me feeling hopeful and with a smile on my face. Surprisingly this sounds good to me though I think I'd struggle to put up with Cat in the early years. I'm glad she turns her life around! I will have to give this a try. Thanks for making me aware of it! She definitely turns around her life and it becomes a bit more enjoyable. I hope you give it a try this summer. Thanks for visiting, Christina! Haha. I completely understand. I tried not to include too many spoilers. Can't wait to hear your thoughts on this one! I hope you enjoy it. Thanks for visiting, Tara!